Kurt and I slept as long as we could in the morning, getting up in just enough time for checkout. We decided the first order of business for the day was to find a nice, greasy breakfast. Perkins would do the trick. Kurt had his standard Eggs Benedict while I had an omelet and toast. To kill time as we waited for the food, we took a quick study of the map, trying to decide where we wanted to go for the day; our trip after the Grand Canyon was completely unplanned. Prior to leaving for the trip, Kurt and I had considered spending a little time in Phoenix and Tucson, however we now noticed an extreme amount of traffic in Flagstaff; it was graduation weekend. So we decided Tucson might not be the best idea considering the location of the University of Arizona. Gradually a plan formed and we decided to spend the day finding our way to Phoenix, and perhaps staying the night near there. After breakfast, we agreed to take a brief tour of Flagstaff. 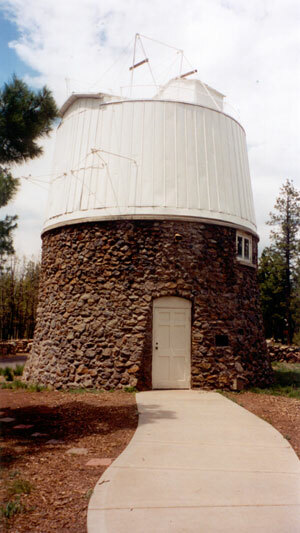 Somehow we managed to ‘get lost’ a couple of times (it was actually a nice tour of the town), but we eventually found our way to Lowell Observatory, where Clyde Tombaugh discovered Pluto. Kurt and I took a quick walk around the observatory campus and through the interactive museum. We didn’t realize until we were leaving that we had inadvertently entered through the back door, thanks to Kurt’s parking job, and therefore avoided paying the admission. Oops. As Kurt and I left town, we were amazed at the number of ‘slug bugs’ – OLD slug bugs – there were. We thought we had hit the jackpot (who knew it was in Flagstaff, not Vegas?). We headed South through the mountains, passing by several incredible views. Our first side trip of the day was about 50 miles down the road – Montezuma Well. We didn’t know what exactly to expect as we had little information about the site; we had seen it on the atlas and the name intrigued us. The first stop in the park was an ancient foundation for the ‘commons’ building of an ancient Native American tribe. The site was really not all that interesting and the number of pesky bugs in the area really annoyed us. Kurt and I got back into the car and drove on to the second stop. This one required a bit of hiking but turned out to be well worth it. We hiked a short distance (against our will, mind you) up to the overlook of a small pond. This pond was formed by an underground stream and provided the ancient Native American tribe with a constant water level all year round. Ruins were built along two sides of the pond, some of which had paths leading to them. The pond also offered irrigation for the tribe to nearby fields. As we walked around, Kurt and I discovered that the temperature had increased dramatically since we dropped out of the mountains around Flagstaff. Welcome back to the desert. 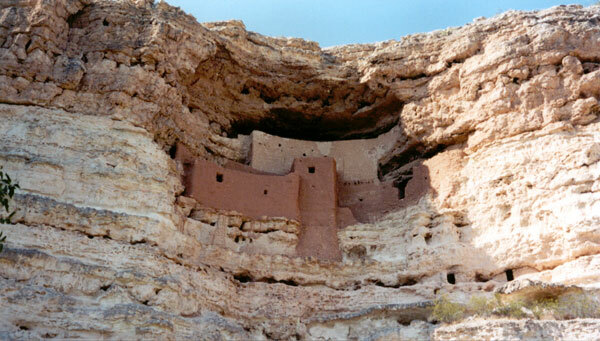 We continued our trek South to Montezuma Castle a little farther down Interstate 17. Here we learned a little more about the ancient tribe. The area had mistakenly been named after Montezuma (an Aztec god) by the Western explorers who discovered the ruins, as they believed the tribes had an Aztec origin. However, archaeologists have since learned that the tribe was not related to the Aztecs at all. Historians are unsure of the fate of the tribe; one theory is that they moved northeast and joined the cliff dwellers in what is now the four corners area. In any case, they left behind intricate dwellings in the cliff overlooking the Verde River. Kurt and I admired the cliff dwellings and of course took a few pictures before heading South once more. Our next adventure took us away from the Interstate. We went in search of Tonto Natural Bridge in a state park northeast of Phoenix. (I chose this destination because of Kurt’s ‘love’ for natural bridges - see last summer's trip) The road took us back up into the mountains and we were amazed to watch how the vegetation types shifted. Just a few hundred feet in elevation changed from yuccas and sand to towering pine trees. We passed through a small town called Strawberry, AZ. Here we saw several roadside Native American art stands. Kurt and I decided we needed to pick up a couple things, so we stopped to look around for a few minutes. After over an hour’s drive total (since we left the Interstate), we arrived at Tonto Natural Bridge State Park. Unfortunately, there was a sign in the middle of the entrance road saying that the park closed at 6pm. Well, it was only 5:30 by our clock, so we of course swerved around the sign and continued on into the park. We drove down into a canyon for another 2 or 3 miles before we encountered a gate with a second sign stating that the park was closed. This one also said that trespassers would be prosecuted. As you probably know, there isn’t much that deters Kurt and I, but we decided it best not to press our luck in this situation. To this day, Kurt is still giving me a hard time for taking us on a ‘wild goose chase’ so far out of the way… Oops. A little disheartened, we continued our drive into Phoenix. 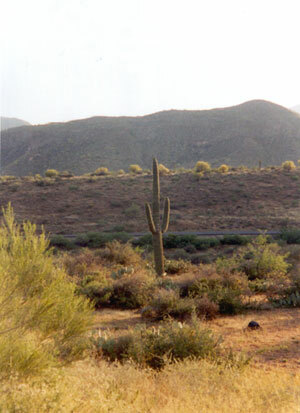 I was immediately cheered up when I spotted my first Saguaro cactus on the side of a mountain. A mile or so later, I saw a second one, then a few more and before long they were everywhere. Some of them were gargantuan, standing maybe 30-40 feet high. Some were just beginning to bloom. Kurt and I pulled the car over beside a dry creek bed to investigate the terrain first-hand. Immediately, we discovered that absolutely everything was prickly and sharp in this part of the desert, from each and every plant to the rocks. Adding to the unfriendly environment, those pesky gnats were back, so we quickly snapped a few photos, got back into the car (we are tough nature-lovers, huh?) and headed towards the Scottsdale city limits. As we were driving into town, I spotted a gigantic fountain (it appeared to shoot a spray of water at least 100 feet into the air) in a housing district just off the highway. It was beckoning us to investigate so Kurt and I found a turn from the main road that looked as though it headed in the general direction of the waterspout. We followed the road through the ensuing suburbia until we arrived at the park housing the giant fountain. Kurt parked the car, I grabbed the camera and we started off to capture a picturesque shot. Strike two, just as I framed the shot the giant spray of water withered away. We waited, hoping it was only for effect. Nothing. The fountain had been shut off and it was only 7:15pm! I appointed Kurt to pick the next activity as I was failing miserably. Kurt’s choice of entertainment led us to the Arizona State Capitol building, located in downtown Phoenix. To get there, we had hopped on the freeway and drove around the downtown area, passing Sun Devil Stadium in Tempe. The capitol building itself was nothing incredibly impressive, so Kurt and I snapped a few pictures to add to our collection and tried to decide what to do next. It was apparent we needed to get some food and have a couple of drinks (since it was a Friday night), so Kurt studied the map and identified a dot on it labeled ‘Old Town Tempe’. He felt this had to be the place to go due to its proximity to the Arizona State Campus. We selected a route from the Capitol to Old Town that led us through downtown Phoenix. Once we arrived in Tempe, we discovered Kurt’s intuition about Old Town had been right. There was a 6 or 8 block strip of restaurants, clubs and shops with people milling about everywhere. We found a parking garage for the Sunfire and proceeded to explore the strip in search of food and drink. Kurt and I settled on Rula Bula Irish Pub and Saddlery. The food was delicious, the atmosphere entertaining and the beer satisfying. Kurt ordered several pints of Guinness, of course, and I had Harp. We ordered a dozen oysters on a half shell to warm up our appetites. For dinner, I ordered a pastry stuffed with stewed beef that had been slow cooked in Guinness while Kurt had a lamb dish. It turns out that the restaurant had actually been built in Ireland and shipped to Tempe brick by brick. No wonder it felt so authentic.